This March is a special time of year. For six days in a row, our senior team, Olympic team, and Team Ahn Ik Soo will be playing friendlies vs opponents like Algeria and Germany. Yesterday we saw Korea NT barely salvage a win vs a heavily turtling Lebanon. Today’s match, however, was much more refreshing as we beat Algeria 2-0 through the usual suspects Kwon Chang Hoon and Moon Chang Jin (MCJ especially scored a WICKED goal and Kim Dong Jun made some incredible saves – you HAVE to watch the highlights). Interestingly enough, Algeria U23 looked like our 2014 team while our U23 team looked like their 2014 senior team. Well, we weren’t THAT good, but Algeria didn’t do much to threaten at all (they could not capitalize on poor defending from SJH and Kim Min Tae) and their keeper made a couple of Jung Sung Ryong esque mistakes. 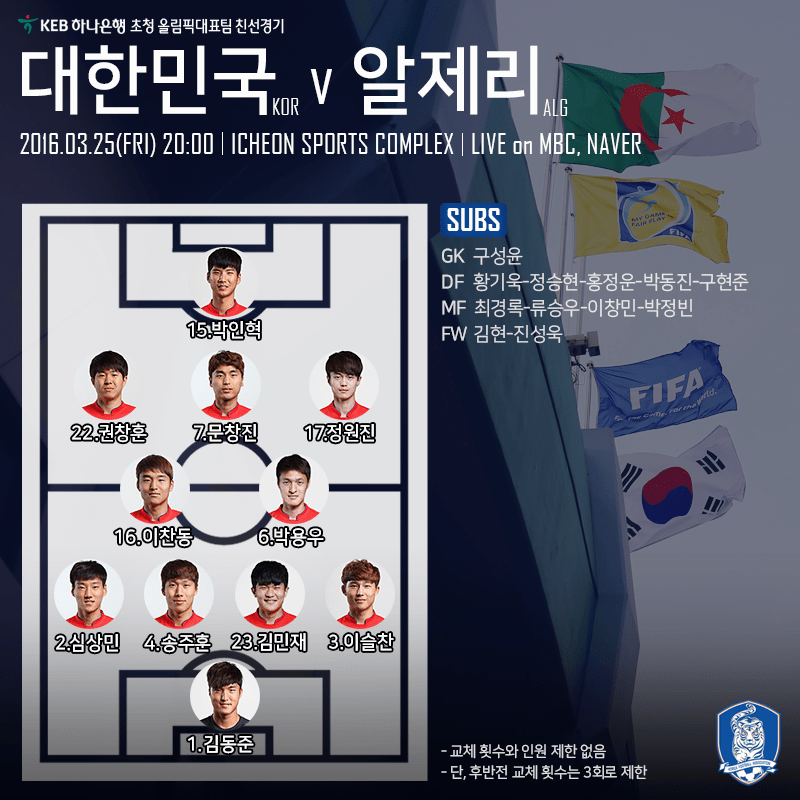 Shin Tae Yong opted for the 4-2-3-1 for the first Algeria game. This is pretty close to a full strength side. Of course Hwang Hee Chan was allowed to focus on his club (he actually started for Salzburg last week). Now what confuses the crap out of me is playing Song Ju Hoon and Kim Min Jae at once. SJH and Yeon Je Min were far from inspiring in both the U22 Championship and their clubs, while the last time Kim Min Jae played (I think it was November, or whatever came after) he was pretty bad. If I was Shin Tae Yong I’d stick to Jeong Seung Hyun of Ulsan Hyundai and Hwang Ki Wook the university player. Another curiosity is the idea to play both The Great Wall Lee Chan Dong and Park Yong Woo. PYW was Lee Chan Dong’s replacement but didn’t fare so well as a purely DM in the 4-1-4-1. I slept through this game but I’d imagine that Park Yong Woo was being evaluated in the role Lee Chang Min usually plays. Tomorrow I hope to actually watch our first friendly against Germany, so stay tuned for that! Awesome article Jinseok, it’s great to see our young KLeague stars shine.